This is a main interface of FLAC To MP3 Converter, You can see all functions. 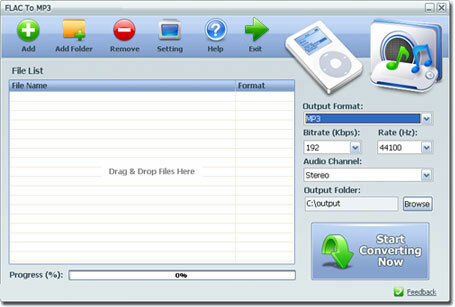 FLAC To MP3 Converter is a small software product to Convert FLAC audio files to MP3 music simply. You can drag and drop FLAC files onto the program then simply click the Start Converting button to start the conversion. All the FLAC audio will be converted to MP3 music within few minutes, and keep the highest quality. There are some options that allows you to set the output MP3 bitrate, rate, and audio channel. Also, the application supports Batch Mode and can convert hundreds of FLAC files to MP3 in bulk. Copyright (c) 2013 FLAC To MP3 Converter. All rights reserved.